A 12-year-old boy has been arrested after a substance was released in a school, prompting an evacuation. Police said a pepper spray aerosol was set off in the rear stairwell of a classroom block at Christ Church High School, Ashford. 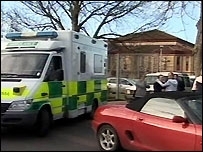 Twenty one pupils were taken to hospital with symptoms including sore eyes, coughing and vomiting. Others were checked by medics at the scene. Two parents were later arrested on suspicion of assaulting police. Police, fire and ambulance teams attended the scene in the Kingsnorth area at about 1220 GMT, and firefighters using breathing apparatus ventilated the building. Ch Insp Martin Bradley said the gas used was an illegal substance which cannot be bought in shops. He said: "It's not clear at this stage whether the canister was actually pointed at individuals in the corridor. "Clearly a lot of gas has affected some of the pupils." He said two adult males were also arrested for causing a disturbance outside the school, and that police used parva spray on them, an entirely different substance from the one used inside the school. Ch Insp Bradley said: "Clearly the parents were concerned about their children and clearly tensions ran quite high. "Two parents were arrested as a result of that tension." The two local men, aged 32 and 37, were arrested on suspicion of assaulting police. Head teacher Catherine Barber said the school acted swiftly and defended claims that some parents had complained the school had not informed them of the incident quickly enough. She added: "It's disappointing that one individual has had a negative impact on the smooth running of the school and interfered in the lessons of the majority of students." Pupil Georgina Fletcher, 11, who was picked up by her mother at the school gates, said: "I was in a humanities lesson when we all started to smell something funny. "We didn't know what it was and a lot of us started coughing. "Then a teacher came in and we were all told to go down to the school medical room. "Lots of people were panicking, some of my friends were coughing and some fainted." 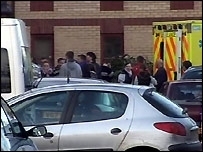 Kent County Council said lessons had continued on Thursday afternoon, and the school would be open as usual on Friday. .